Intel in 2018: wait, how many processors? You can’t avoid the fact that 2018 was simply a bizarre year for PC components overall – especially when it comes to the best processors. Intel spent the whole year churning out microarchitecture after microarchitecture, in an attempt to prevent AMD from taking too much market share. But, throughout the myriad products Intel released this year, we were left wondering if there was something missing. So, we’re going to dive into everything Intel achieved over the last year, creating a sort of report card on how the tech giant handled 2018. Intel didn’t exactly start 2018 off on the right foot – a white paper from Google Project Zero revealed the Spectre and Meltdown exploits that made 90% of Intel processors vulnerable to attack. Intel immediately responded, saying it would fix the exploits. However, there was a ton of confusion out there related to these fixes. Initially, Intel suggested that these fixes would impact stability and performance by up to 30%, which it later redacted, saying that the slowdown would be ‘workload-related’, and that most users wouldn’t notice any change. And, eventually the patches made their way through Windows Update, but not everyone got a happily ever after. In April, Intel said that certain older processors wouldn’t be getting the update, namely the Intel Core i7 900 series, due to issues with the microarchitecture itself. It also cited the fact that most of these older processors weren’t being serviced anyway. Luckily, if you buy a newer Intel Coffee Lake Refresh processor you have nothing to worry about. In a move that threw us all for a loop, Intel teamed up with AMD earlier in the year to produce 8th-generation Kaby Lake processors for laptops with AMD Vega graphics. Especially in a year when Intel has been plotting its own GPUs, this team up with its biggest rival kind of came out of nowhere. But, you know what? It paid off. These Kaby Lake G processors provided awesome performance without some of the pitfalls that dedicated graphics experience. Laptops like the Dell XPS 15 2-in-1 showed great performance, not just in professional workloads, but even in gaming. That’s right, these laptop CPUs enabled a pretty decent gaming experience on laptops that were thin, light and convertible. Of course, Intel doesn’t just make chunks of silicon, it also makes full-fledged computers occasionally. And, the Intel Hades Canyon NUC, beyond having an awesome name, is genuinely one of the best gaming PCs you can get – as long as you’re looking for a very tiny machine. Now, while this tiny PC doesn’t come with RAM, storage or an OS – you’ll have to supply all that on your own, you are paying just $799 (£743, AU$1,099) for a pretty powerful little machine. It packs one of those Kaby Lake G processors we just talked about, which means it can provide GTX 1060-level performance for a fraction of the price of a similarly specced gaming laptop. And, because it’s a barebones system, you can upgrade it however you want. Well, barring the GPU and CPU, of course – at least it has ThunderBolt 3 for external graphics. Back at Computex 2018, we were sure we’d get some new processors from either Intel or AMD. And, while both manufacturers teased some HEDT chips, we just got some vague glimpses. But, the chip Intel teased was absolutely insane. We’re talking a 28-core, 56-thread behemoth that was overclocked to 5.0GHz across all cores. Turns out that it was overclocked to high heaven using some exotic cooling methods, but it was still impressive anyways. Turns out that it wasn’t a consumer chip at all, but instead the Intel Xeon W-3175X workstation chip. This chip isn’t quite out yet, but it’s around the corner and is rumored to launch it at a whopping $4,000 (£4,000, about AU$5,600) price tag. Still, dreaming about such an insane consumer processor was fun while it lasted. 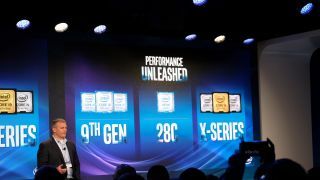 Intel also used the event to introduce a special anniversary processor in the form of the Intel Core i7-8086K to commemorate the original 8086 CPU that released 40 years ago. Coffee Lake was already a massive success, thanks to the awesome desktop performance it offered, but when Intel brought Coffee Lake H-series processors for laptops, the performance was off the charts. Coffee Lake H-series brought Intel’s 6-core 12-thread mobile processors to laptops for the first time, including the overwhelmingly powerful Intel Core i9-8950HK, found in even the thinnest workstation-class laptops like the MacBook Pro 15-inch. Where these processors really shined, however, was in the best gaming laptops. Devices like the Razer Blade 15 and MSI GS65 Stealth were able to stay thin, light and aesthetic while providing nearly desktop-class performance. However, some manufacturers took that thin, light and powerful concept a little too far. We already mentioned the 15-inch MacBook Pro, but when that thing launched back in July, there was an uproar about its tendency to thermal throttle almost immediately. This problem was patched out by Apple almost immediately – but it still runs dangerously hot. The Core i9-8950HK offers fantastic performance, but it basically requires a heavy duty laptop to reach its full potential. But, the rest of the Intel Coffee Lake H-series mobile processors don’t have the same problem. Intel has never been the easiest manufacturer to follow, but it seems like in 2018, there was just a deluge of different microarchitectures, all of which named after some fictional lake. Beyond the ever-elusive Cannon Lake, we got Whiskey Lake, Cascade Lake, Amber Lake and Coffee Lake Refresh. That’s not even mentioning the non-lake microarchitectures like the HEDT-focused Basin Falls Refresh. Most of the year ended up being a guessing game, trying to pin rumored silicon to the lake it belonged to. And, with Cannon Lake and Sunny Cove already rumored for 2019, it looks like the same shotgun approach is going to repeat itself next year. After months of speculation and false leads, Intel finally released its 9th-generation Coffee Lake Refresh consumer and Basin Falls Refresh HEDT chips. Basin Falls Refresh might not have been all that exciting, but the level of performance offered by Coffee Lake Refresh is worth a mention. The Intel Core i9-9900K, by itself, was worth all the headaches – a 8-core, 16-thread CPU that absolutely demolished the AMD Ryzen 7 2700X – along with many Threadripper 2nd Generation chips. You see, it wasn’t just the core counts that matter here – it’s the clock speeds. This consumer chip is able to boost up to 5GHz – and that’s before overclocking. Less than a month later, Intel would also release the new Intel Core i9-9980XE to reclaim the high-end desktop processor crown. What does 2019 have in store for Intel? 2018 was a year of reactions and delays from Intel, as it desperately fought to maintain its place in the market, and basically lost. However, don’t think for a second that Intel is down for the count. After years of delaying its 10nm Cannon Lake chips, there are already rumors that Intel is going to release Sunny Cove next year, which is … well, it’s another 10nm microarchitecture. We should see increased performance and efficiency with this shrink in die size, but with AMD getting ready to launch 7nm Ryzen 3 processors in 2019, the competition is only going to get more heated from here. What should be particularly interesting, however, is Intel’s GPUs. Intel graphics cards have been lurking in the shadows for a while now. We’re not sure what these graphics cards will be capable, and we likely won’t see them actually materialize in 2019. But, if its Gen11 integrated graphics are any indication, we’re going to brace ourselves for a late entry in the Nvidia vs AMD GPU war.